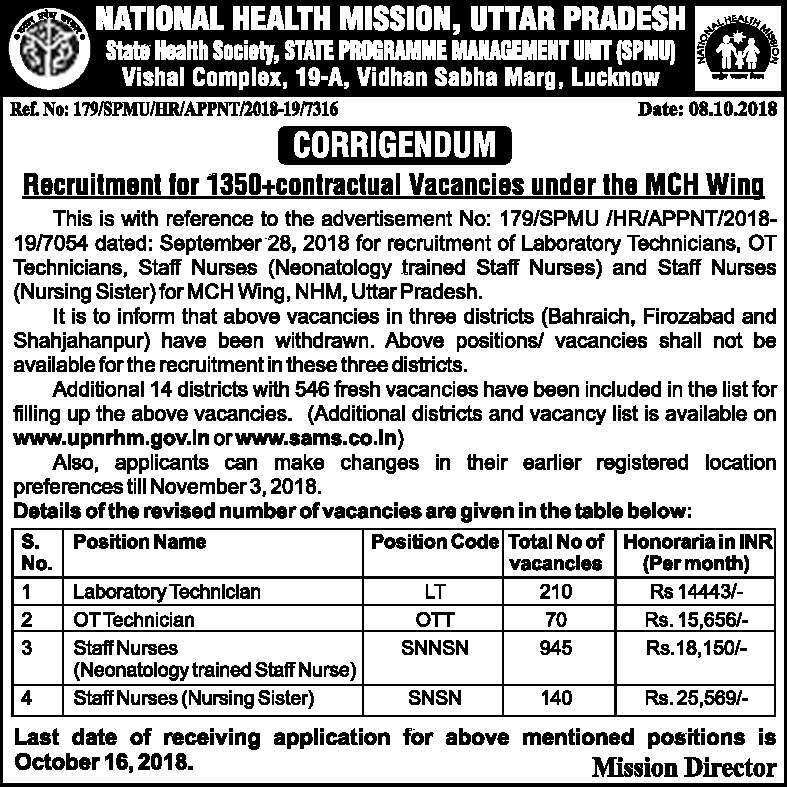 NHM UP Recruitment 2018 Vacancy of Staff Nurse, ANM, Lab Technician & Attendant, National Health Mission NHM UP ANM Recruitment 2018. NHM UP Health Department Recruitment 2018 Invited Application to fill Samvida bharti of 4688 Staff Nurse, ANM, Lab Technician, Lab Attendant and PRO in all State Division District under National Health Mission. 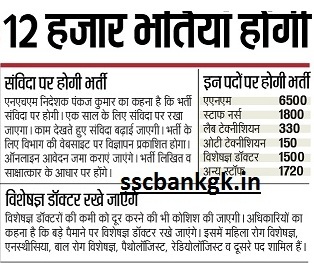 for graduate it is the best opportunity which are invited from NHM. The job seeker willing to work in mission mode for engagement on NHM UP Candidates have to apply online in the website: parikshaup. 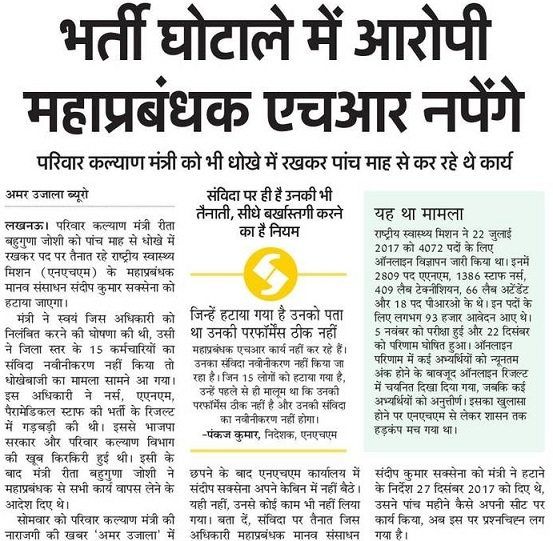 Every year NHM published the employment news on contractual basis vacancies. NHM UP 1350 Vacancies 2018: Additional 14 District Added with 546 Fresh Vacancies have been included in the list for above vacancies.For More details aspirant can see NHM UP 1350 Vacancies Update on Official website. Withdrawn District: Bahraich, Firozabad and Shahjahanpur. Last Date for Receiving application is 15 October which will be extended also. NHM Recruitment 2018 Recruitment Notice for Appointment of Laboratory Technician, OT Technicians, Staff Nurses in (Neonatology Trained Staff Nurses) and Staff Nurses (Nursing Sister). Last Date of Submitting Application Form is 14 October 2018. UP NRHM Recruitment 2018:- Latest Update 30 September Recruitment of State Program Manager Position under NHM, U.P. Top Management/ Senior/ Mid-level Vacancies, Uttar Pradesh Medical Supplies Corporation (UPMSC), Lucknow. Announcement of Written Test Result for Personal Interview / Skill Test / Group Discussion :- soon update of Personal Interview Result. NHM UP 4072 Recruitment 2018:- Latest news of 22 May is NHM Main Secretary will be eliminated from its posts after checking corruption charges or unwanted selection of candidates in recruitment process of 4072 2809 ANM, 1386 Nurse etc. Check below. NHM UP Syllabus 2018 Question & Answer: Only short listed candidates will be called for interview. 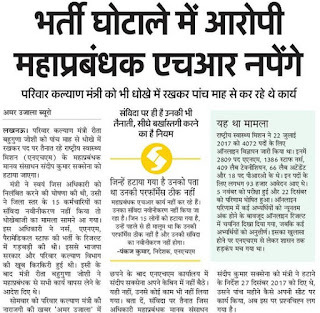 NHM UP Paper was made for Data Operator, Program Assistant in which typing test is required. And for Consultant jobs in Quality Assurance will be held only interview. Question will be asked from District State Division where you have applied. Final Merit list Prepared when after selection. NHM Question Paper 2018 Previous Year: In exam question paper or in Interview some essay asked under Short Notes on the NHM Scheme was launched. Some Highlights are The National Health Mission was launched with a view to bringing improvements to the health system and health status of people its main focus to those people who live in the rural areas of the country which is today maximum 60%. The NHM Mission seeks to provide universal access or coverage to affordable and quality health care system. At the same time responsive to the needs of the people, reduction of child and maternal (pregnant woman) deaths as well as population control, gender and demographic equality. In this process, the Objective of NHM Mission To helps achieve goals set under the National Health Policy and the Millennium Development Goals. 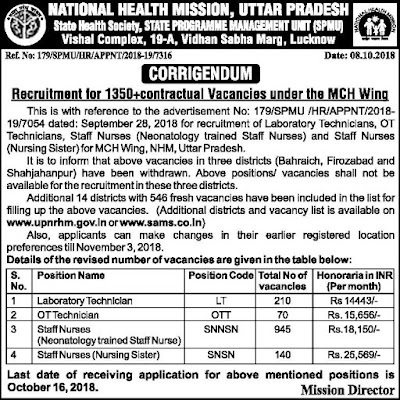 Name of the Organization: National Health Mission UP Vacancy posts on NHM offer on a contractual basis, initially for a period of one year, extendable thereafter, based on performance and subject to further approval by the Government of India. Age Limit: Up to 50 years as on date of advertisement. Educational Qualification: According to posts (Graduate Pass, Master Degree in Arts Science Commerce) Special preference to those if they have any diploma in Minimum relevant experience in to Health Sector. Selection Process: Written Exam, Interview Cut off marks Effective communication skills, with demonstrated ability to talk and listen. Pay Scale: Salary in NHM Vacancy 2018 Gross compensation budgeted for the position is approx. Rs. 10,000 to 44,000/- Per Month. Related posts to NRHM Recruitment 2018: we will soon update NRHM Result 2017, Contract basis jobs renewal date, salary latest news and expected date to be release of new vacancy. Total No. of Posts: 500 plus.